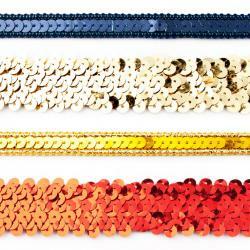 Our sequin trims are 10mm and 30mm wide and can be ordered per meter. These trims have a very festive appearance and are therefore suitable for finishing, among other things, party clothing. Sequin Trim 10mm - Black..
Sequin Trim 10mm - Brown..
Sequin Trim 10mm - Dark Blue..
Sequin Trim 10mm - Purple..
Sequin Trim 10mm - Cobalt..
Sequin Trim 10mm - Red..
Sequin Trim 10mm - Fuchsia..
Sequin Trim 10mm - Orange..
Sequin Trim 10mm - Apple green..
Sequin Trim 10mm - Lime..
Sequin Trim 10mm - Yellow Gold..
Sequin Trim 10mm - Lilac..
Sequin Trim 10mm - Silver..
Sequin Trim 10mm - Gold..
Sequin Trim 10mm - Mother of Pearl..
Sequin Trim 10mm - Ecru..
Sequin Trim Stretch 30mm - Black..
Sequin Trim Stretch 30mm - Brown..
Sequin Trim Stretch 30mm - Purple..
Sequin Trim Stretch 30mm - Cobalt..